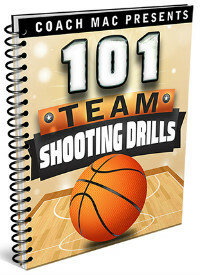 Thank you for purchasing the 101 Team Shooting Drills eBook. As you can see, instead of sending you a PDF that will expire in 24 hours (I hate eBooks like that), I’ve decided to create a page on BFC with the 101 Team Shooting Drills eBook that you can access at any time for your convenience. Because of this, I ask that you don’t share the link to this page with anyone else. I’m trusting the honesty of all buyers which I know I can do since I’ve been around this community of great coaches for so long! If you did arrived at this page without purchasing the eBook, I ask that you send me an email at [email protected] and let me know how you found the link so I can remove it. To download the PDF, right click and click ‘Save Link As…’ or click the download link when the PDF is in your browser. If you have any questions or feedback on the Shooting Superstars Program, send me an email at [email protected] and I’ll get back to you as soon as possible. Seriously, thank you so much for purchasing the Shooting Superstars Program! I hope the resources provided assist you developing a better team and becoming a better coach.